Best time to GO: May - October. Both the summer and fall seasons have their own unique appeal. A much loved annual tradition of visiting Stout's Island Lodge with longtime family friends. Our kids' range in age with eight years between them, and this charming island allows us to find things that all of us can do together. It's an easy 2.5-hour drive from Minneapolis to Birchwood, WI. The address to the lodge takes you to a parking lot that is adjacent to the Shore House and dock. I recommend you drive up the gravel path to the Shore House to unload your bags before parking your car in the lot. Another good to know tidbit- the Shore House does have a bathroom available to use while you wait for the ferry. Guests are picked up at the Shore House dock on the hour. Ferry pick-ups begin each day at 8:00 a.m. and end at 10:00 p.m. The ferry crew will assist guests with luggage and boarding. The trip to the island is approximately 5-10 minutes. 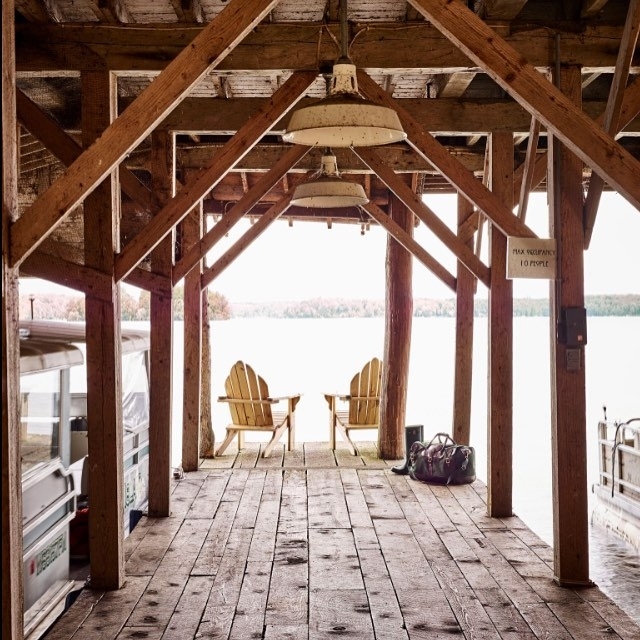 Once you arrive at Stout’s rustic boathouse, staff will check you in, direct you to your rooms, and deliver your luggage. If you have time, get to know the island in the daylight. However, if you arrive in the evening, the walk along the candlelit path to the main lodge is a magical island welcome. Stop in for a glass of wine, grab S’mores kits for the kids, and head on down to the nightly bonfire, sit, regroup and relax. The island is named for Frank Stout, the rich son of a lumber baron. In 1903 Stout constructed the original main lodge. The wood for the lodge was imported from the Black Forest in Germany. To give it an authentic look, Stout insisted the bark was left on the logs. Unfortunately the bark became infested with bugs which forced Mr. Stout to burn the entire building in 1912 and rebuild. By 1915 Mr. Stout had spent about 1.5 million on the construction of the island which in present day is equivalent to $35 million. The lodge that stands today is truly a wonder with beautifully carved beams, wide plank flooring, tall ceilings, huge chandeliers and massive stone fireplaces. The island has 11 unique cabins with multiple rooms to rent. Only a few are original while others have been added and updated through the years. The older cabins are rustic but elegant while the newer cabins have a Northwood's feel. Our families like to be in the same cabin. For this reason, we have found that planning ahead and making reservations as far in advance as possible gives us better options. Stouts Island website has photos and descriptions of all the rooms. 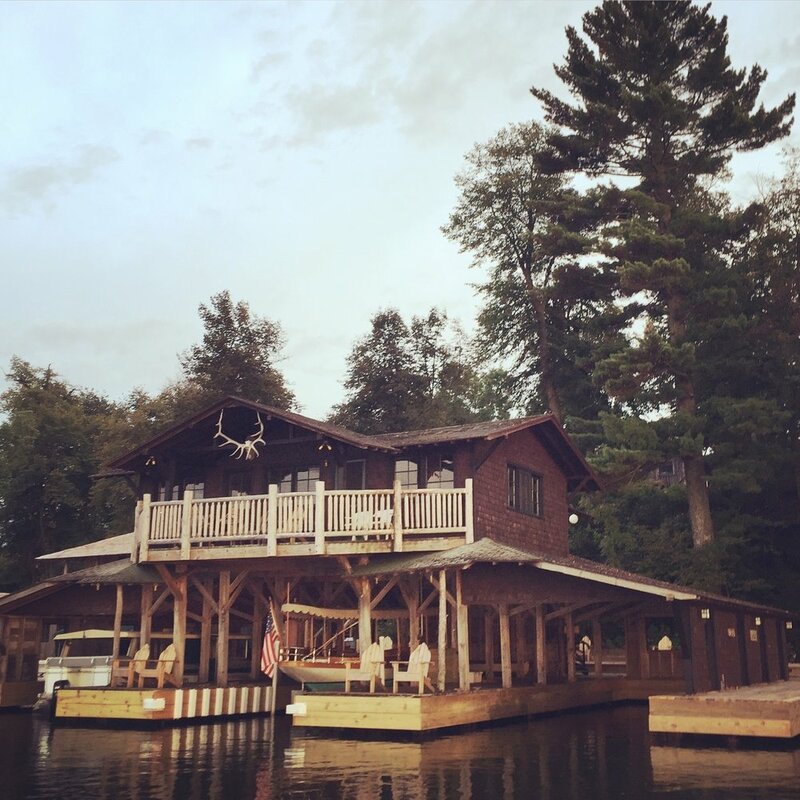 Our preferences are, Allison 1 and 2, which is one of the original cabins built in the 1900's, the Main Lodge 2 and 3, with a deck and screened in porch, and the Shore Lodge rooms on the lake. The size and location of Willson 1 and 2 are also favorites of ours and good for families with young children. You really can’t go wrong. We spend very little time in the cabin and all of the beds are comfortable with good linens. You don't even need to bring your own pillow. Photo Credit: J.W. Hulme Co.
You can take a stroll around the gardens, sit on the vast lawn and take in the incredible view or find a spot to read and nap. Trust me, there is NO shortage of Adirondack chairs on the island. They are everywhere. Order a delicious sack lunch at the restaurant and have a picnic under a Weeping Willow tree. Spend the afternoon playing lawn games like Bocce, Giant Jenga or Croquet. If the weather isn't cooperating or you need a break from the sun the main lodge has a fireplace, comfy chairs and a library of books and board games you can borrow. If lounging is not your thing, go swimming or paddle boarding off the dock. Take a walk to the West end of the island and use the available canoes, kayaks and hydro bikes to explore the lake. On the East side of the island, you can play tennis on the beautiful clay court, head over the bridge and go on a little hike along the windy path through the trees, or skip rocks at the waters edge. There is so much and so very little to do, all at the same time. The Stout's Island Restaurant is located in the Main Lodge. A continental breakfast, well worth getting out of bed for, is included with your stay. We must say that the homemade granola is a favorite of ours. It is a granola lover’s dream come true. You must try it. If you agree, buy a bag or two or three in the main office. We can’t leave the island without some. Guests may also order a hot breakfast from the menu for an additional cost. The Main Lodge restaurant is open for lunch and dinner. Reservations in this quaint dining room are recommended but not required at these times. Keep in mind, the restaurant is not exclusive to guests and consider the dress code mentioned on their website. Stout Island website gives permission to bring your own food and drinks to the island but asks that you store these in your cabin. Depending on your accommodations and whether you have a kitchenette or mini fridge make sure to bring drinks, snacks, and options for mini meals for your family. With that said, if you are bringing food, be sure to bring utensils, plates and napkins. They provide beach towels at the resort but I suggest bring a carryall to tote stuff around the island, a good book and a fleece for evenings by the campfire. We always intend to do a lake cruise on the beautiful, antique Elco boat you see in the boathouse. They offer a family friendly day cruise as well as a happy hour and sunset cruise. This is on my list for next time, although when we are there it seems so hard to leave the island, even for an hour.